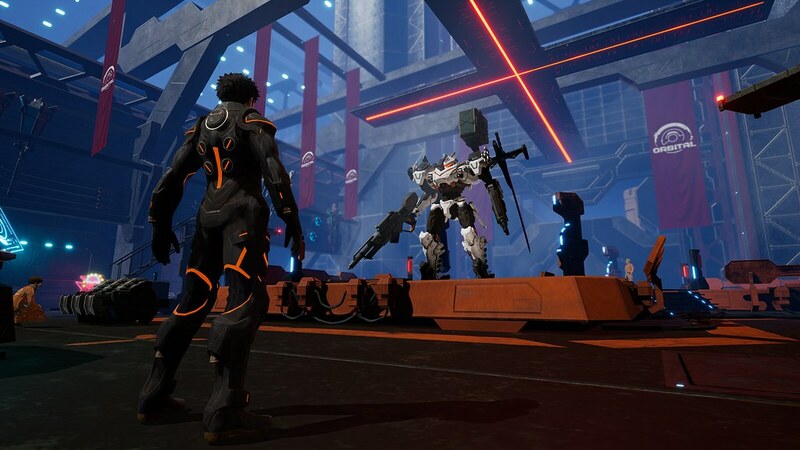 A brand-new, fast-paced mech action game from Kenichiro Tsukuda is coming to the Nintendo Switch system. Take your Arsenal, a fully customizable powered suit, out for an array of missions to surmount the enemy at all costs. Choose and equip your Arsenal with a multitude of weapons, obtain more from downed enemy Arsenals, and swap them on the fly to suit your strategy in the face of ever-changing threats. • Kenichiro Tsukuda is well known for his work developing the Armored Core series. He and his talented team have developed this brand-new title with the goal of making it “the best mech action game” out there. • The character designs were created by Yusuke Kozaki, who also worked on the Fire Emblem Awakening and Fire Emblem Fates games. • Mech concept designs were created by Mr. Kawamori, who also worked on the Armored Core series and the Super Dimension Fortress Macross series. • Arsenals can battle freely in the air and on the ground.